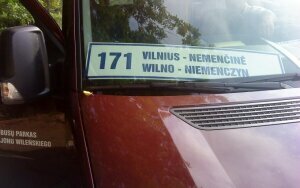 On buses which are taking one of new routes in Vilnius District appeared bilingual inscriptions: ‘Vilnius-Rastinėnai’- in Lithuanian and ‘Wilno-Rostyniany’- in Polish.The State Commission of the Lithuanian Language (pl. Inspekscja Języka Państwowego, lit. Valstybinė lietuvių kalbos komisija) stated that ‘unfortunately’ they cannot do anything until the Parliament does not accept appropriate amendments, reported a daily newspaper ‘Lietuvos žinios’. The head of the State Commission of the Lithuanian LanguageDonatas Smalinskas informed that in 2011 the Supreme Administrative Court of Lithuania (pl. Litewski Naczelny Sąd Administracyjny) cancelled the penalty for bilingual names of bus routes because in the Law is no determination of public inscriptions. In his opinion the commission does not have legal basis to fight with Polish names of bus routes. ‘We are looking forward to the enactment of the Law on the State Language in which would be determined the term of public inscription. Then everything will fall into place’, said Smalinskas. The manager of the Bus Depot of Vilnius District Dariusz Gasperowicz for ‘Lietuvos žinios’ said that bilingual inscriptions are for people of national minorities living in Vilnius District because part of passengers of older age know only Polish or Russian and speak Lithuanian.